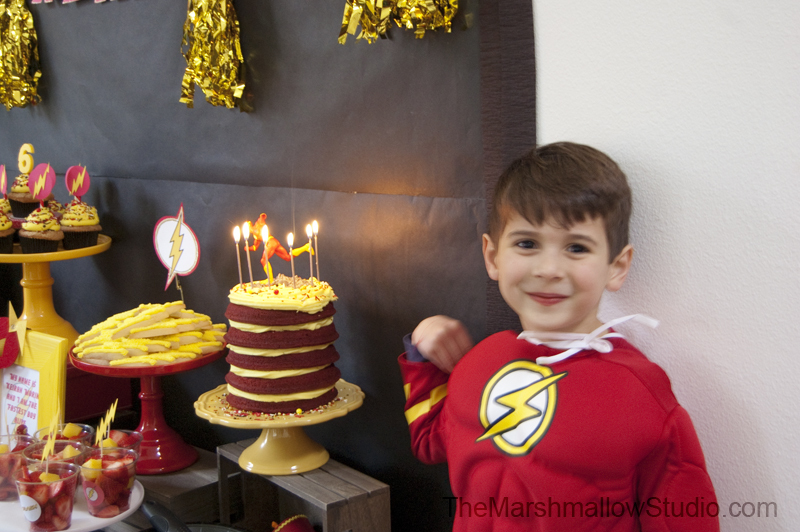 His dream of having a Flash-themed birthday party finally came true a couple of weeks ago. 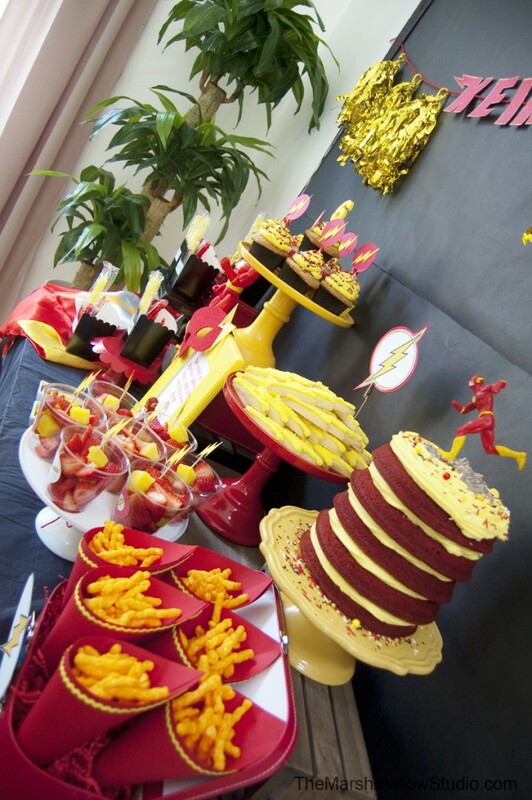 We celebrated his 6th birthday with an all red, and yellow party dazzled with a little gold and night black. As usual, I started the party planning process by designing the printables (invitations, stickers, labels, decorations, thank you cards, etc). Next, I checked out Oriental Trading’s website for fabulous items for the party – decorations, party favors, party supplies…. they have it all! 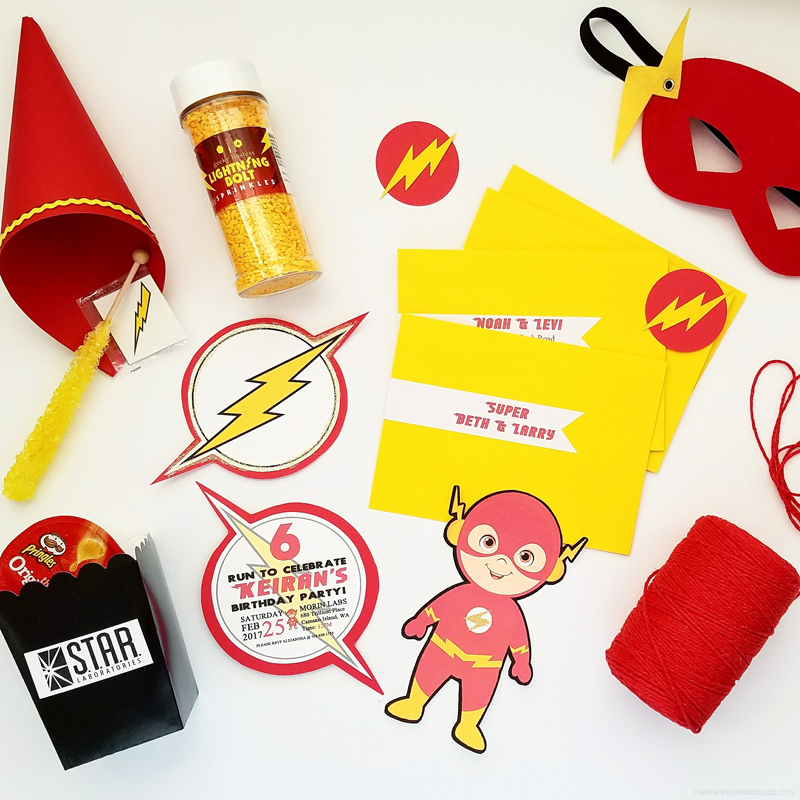 Although they don’t necessarily carry The Flash licensed products, they do carry a variety of superhero goodies that went perfectly with our theme. And let me make sure to point out – they carry TONS of costumes too! 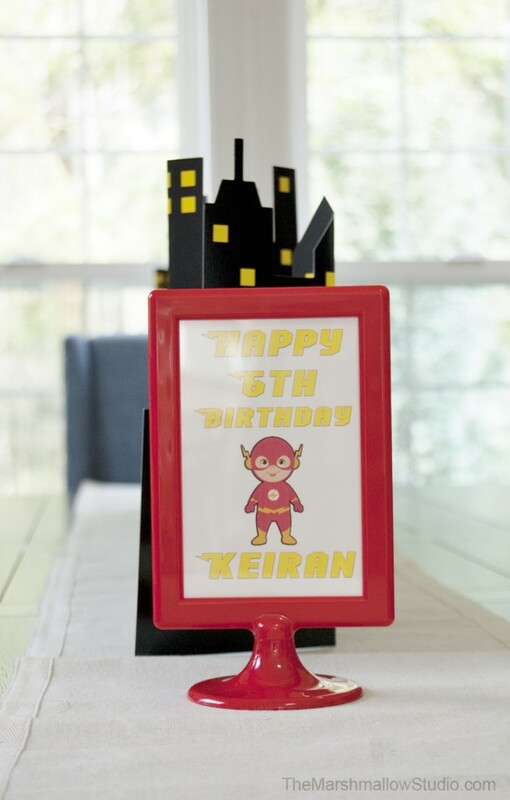 I ordered Keiran a brand NEW The Flash Costume just for his birthday. He wants to wear it daily. The one he had, he has used for the past two Halloweens already and it didn’t have “muscles” like he wanted. 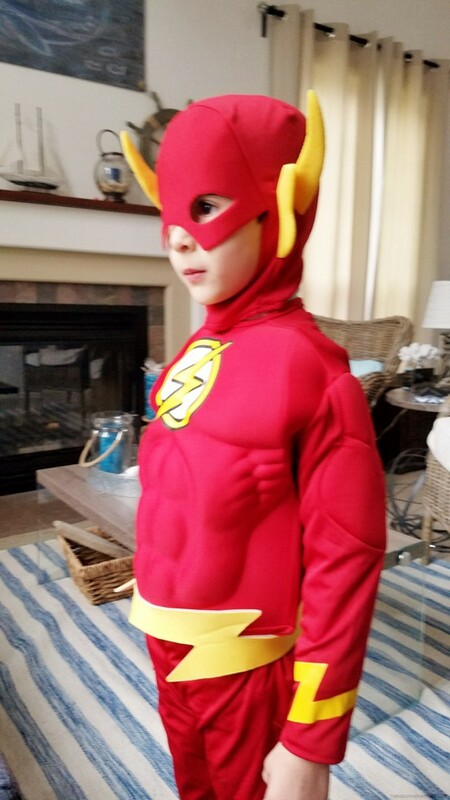 Plus, it was starting to fit him a little tight and he already told us he wants to be The Flash again this Halloween. I loved not having to search high and low for a new costume. I simply ordered it with the rest of my items from Oriental Trading. 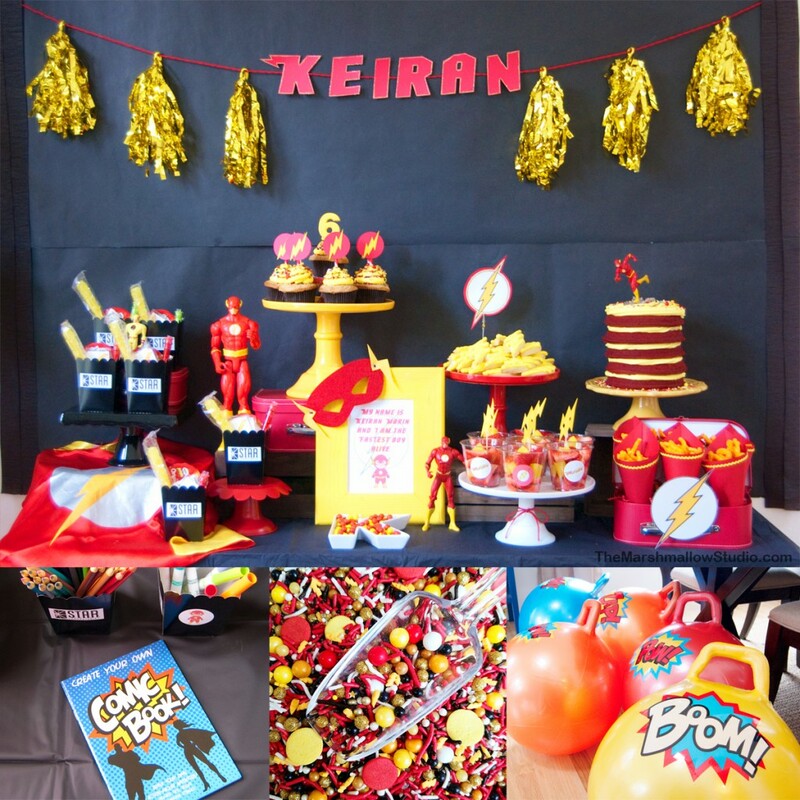 This was the first party that Keiran actually got super excited for and even got involved in the planning, crafting and decorating. Normally, Aiden is my helper. He helped me put together the dessert table, the kids’ activity table and hang balloons. I started planning his party at the beginning of January; my poor K was counting down the days to his party since then LOL! Now, let’s talk about the deeeets. 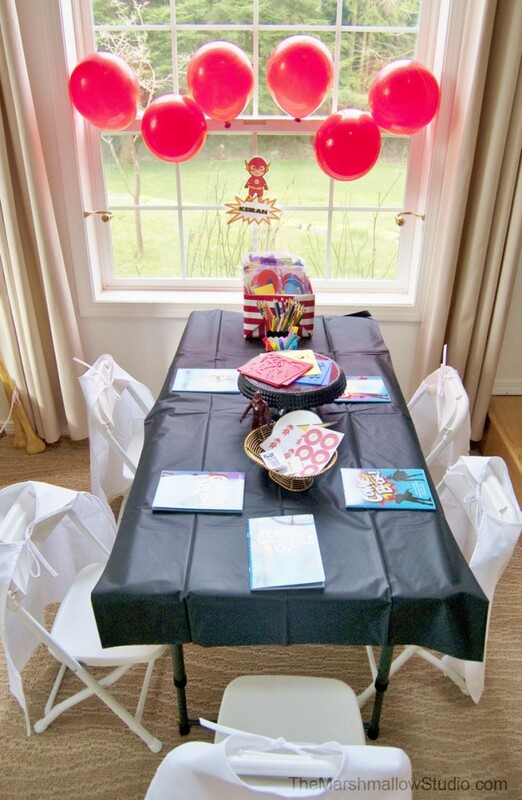 The party was at noon and we were only having a few guests over so we went super simple and easy with the menu. I purchased a couple of sandwich trays from Costco and served them up next to a variety of chips and veggies. 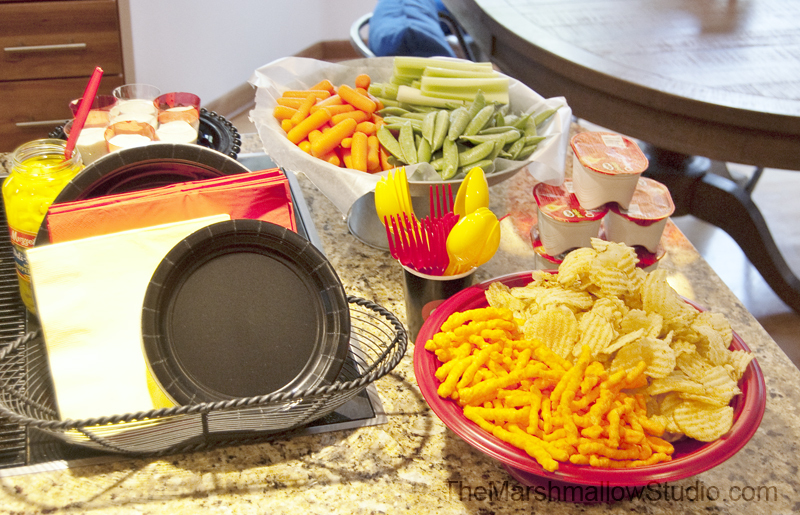 I had shot glasses filled with ranch dressing so guests could grab-n-go dip for their veggies. The pepperoncini peppers were bomb-diggity in these sandwiches. 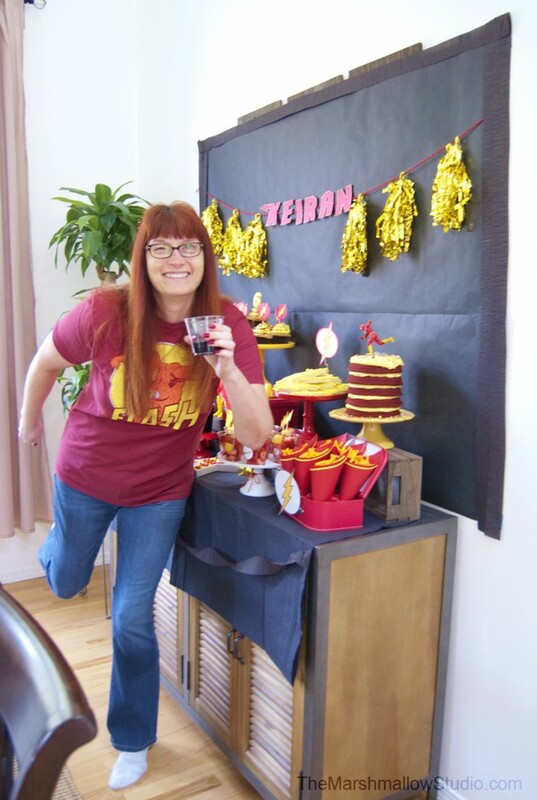 The Flash even had some groupies at his party! I like having a dedicated area where the kids can be kids. 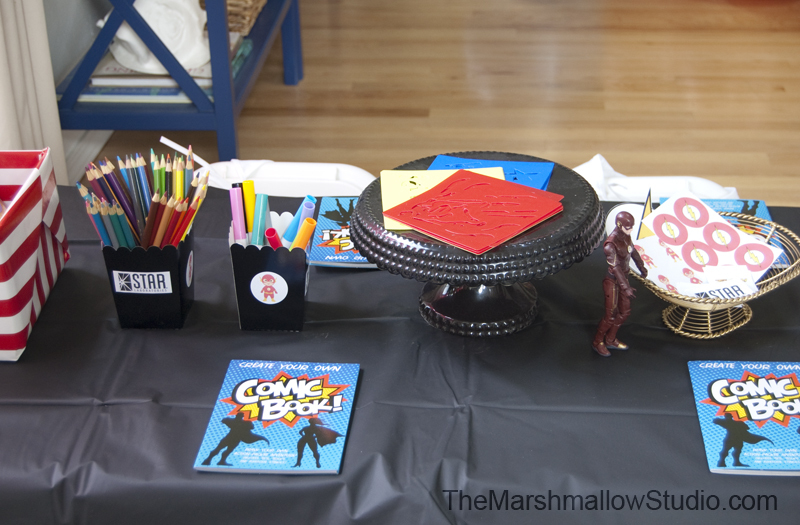 This time, I set up a short table with kid-size chairs – here they could have some fun and get creative with a few activities I had set up for them. 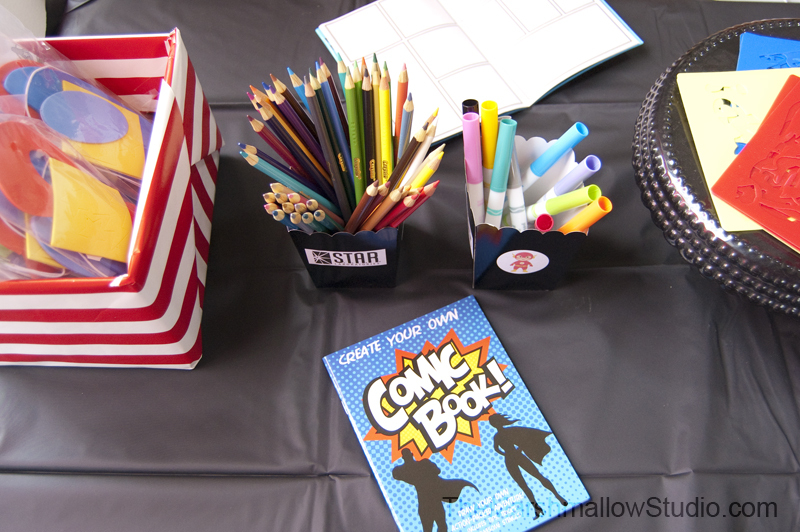 Each of the kiddos got to create their own fantastic story in their fabulous Superhero Comic Book PadComic Book Pads. 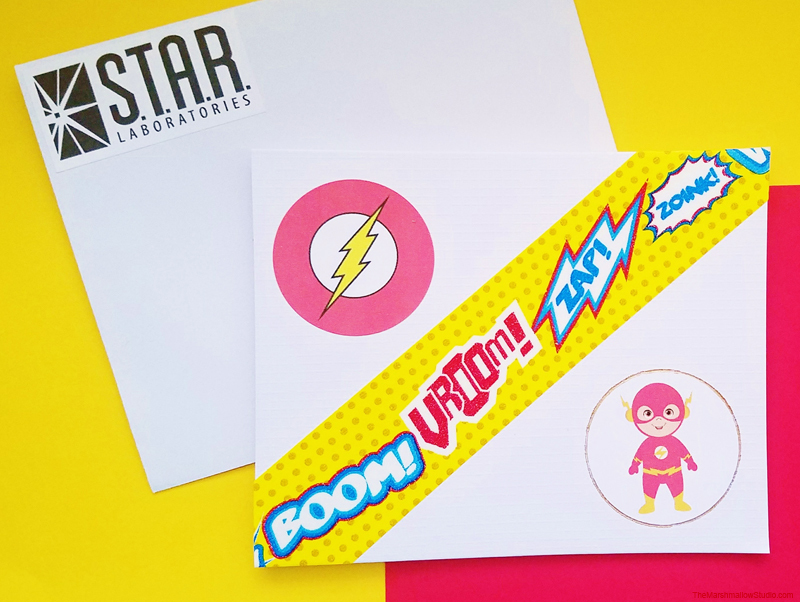 They used color pencils, Superhero Stencils and stickers to bring their imagination to life. 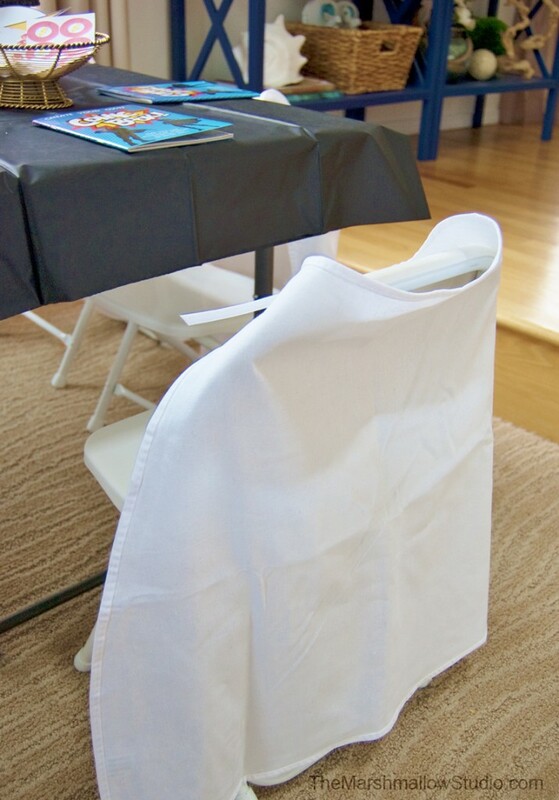 They also had white DIY Canvas Capes that they could decorate with Crayola Fabric Markers. 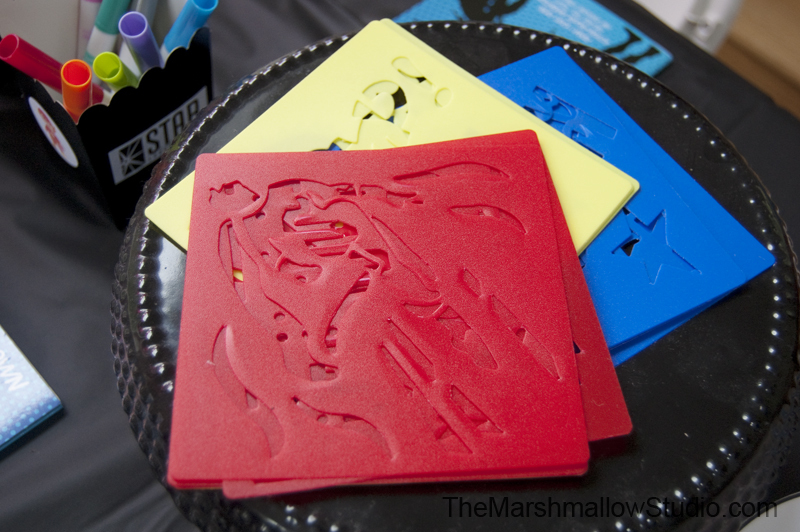 And, of course, they also had fabulous Superhero Foam Mask Craft Kit they could decorate and wear along with their capes. 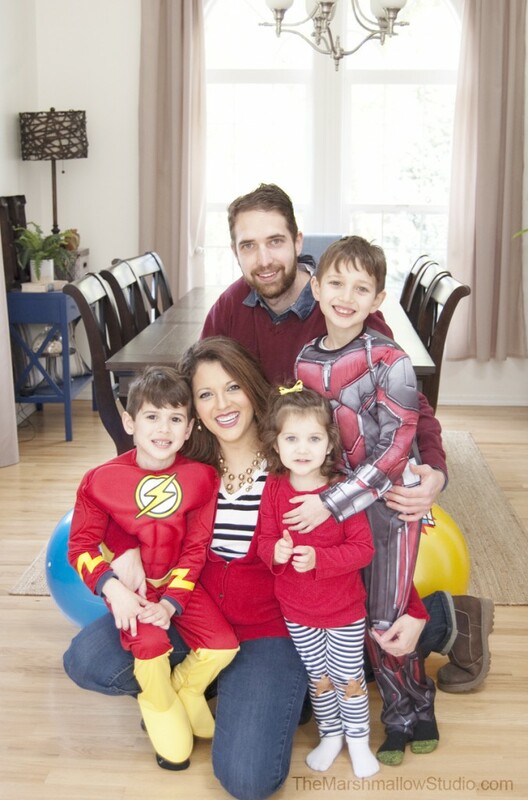 We had a house full of masked superheroes bouncing around! 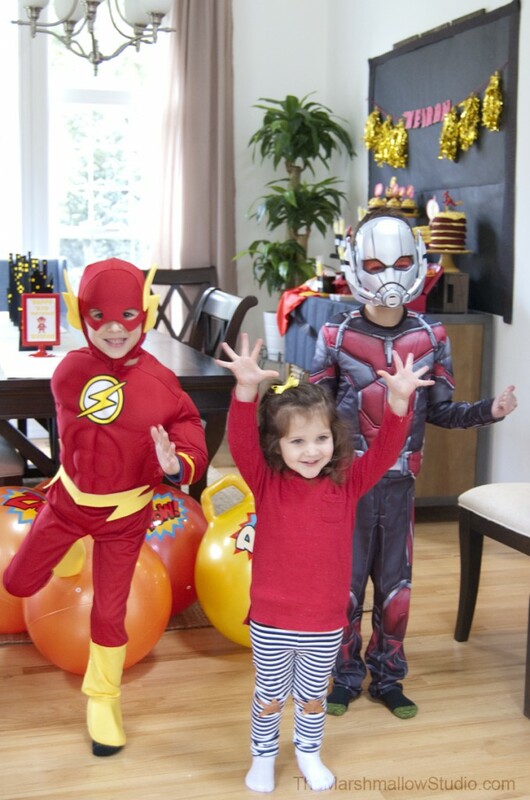 These Superhero Happy Hoppers were the HIT OF THE PARTY, though. Our little guests couldn’t believe they got to keep these after the party and take them home with them. 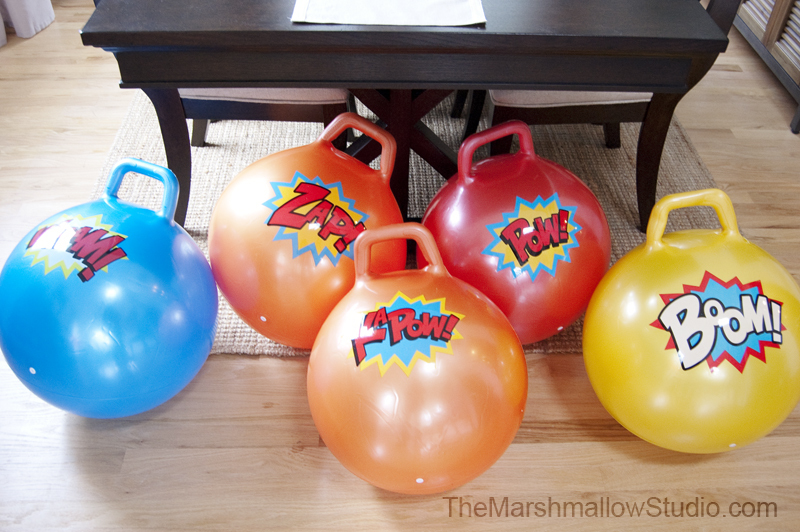 Now, I feel like EVERY party should have these bouncy balls….. and somebody needs to make some in adult size too, please! After the madness of superhero kid crime fighting and adult chitty-chatting, it was time to dig into the sweets. I used my dining room console to host the dessert station. I semi-covered it with a black paper tablecloth and taped black construction paper on the wall behind it to give me a clean black background to work off of. 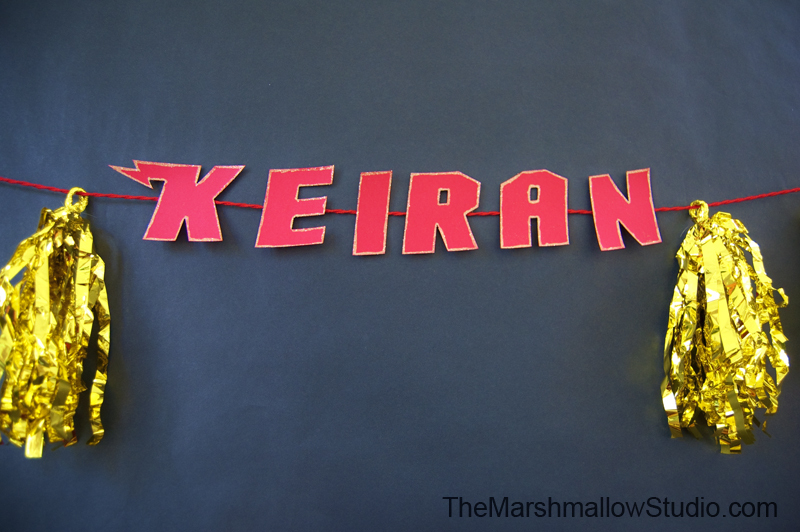 I cut out letters for his name out of red cardstock paper and used gold glitter glue to add a border around each. Next, I hung a piece of red twine from side to side of the backdrop. I hung six fold foil tassels that I purchased from Target. Finally, I taped on the letters over the string in the center area. I covered up the black paper edges and the hanging twine with a double border of black streamer. 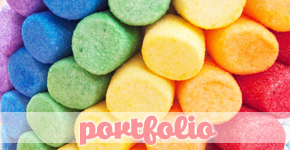 In retrospect, I perhaps could have been a little more crafty with his banner but too late now, haha! 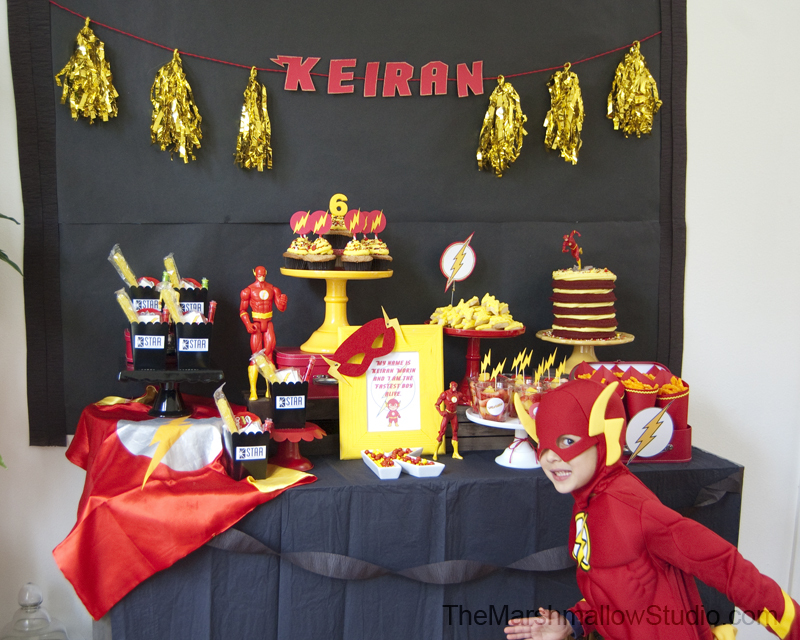 I displayed several of Keiran’s Flash action figures throughout the table and party. Psst: there’s another one hiding on this table… let’s see if you can find it! The desserts consisted of a naked red velvet layer cakes with cream cheese frosting, lighting bolt sugar cookies with buttercream frosting, butter pecan cupcakes with sweet cream frosting and strawberry-pineapple fruit cups. On the table, I also had color-coordinated Sixlets, Cheetos-filled paper cones and the little favor boxes for the kiddos. I skipped all the hard work of making a layered cake by simply using Wilton’s Easy Layers Cake Pan Set . If you don’t have one, get one! They’re also available in rectangle and heart-shaped pans. If you follow me on Instagram you know that I am obsessed with sprinkles. I can’t even help myself. I see them, I buy them. Luckily for me, I also use them quite often in my parties, special occasions and in everyday desserts. 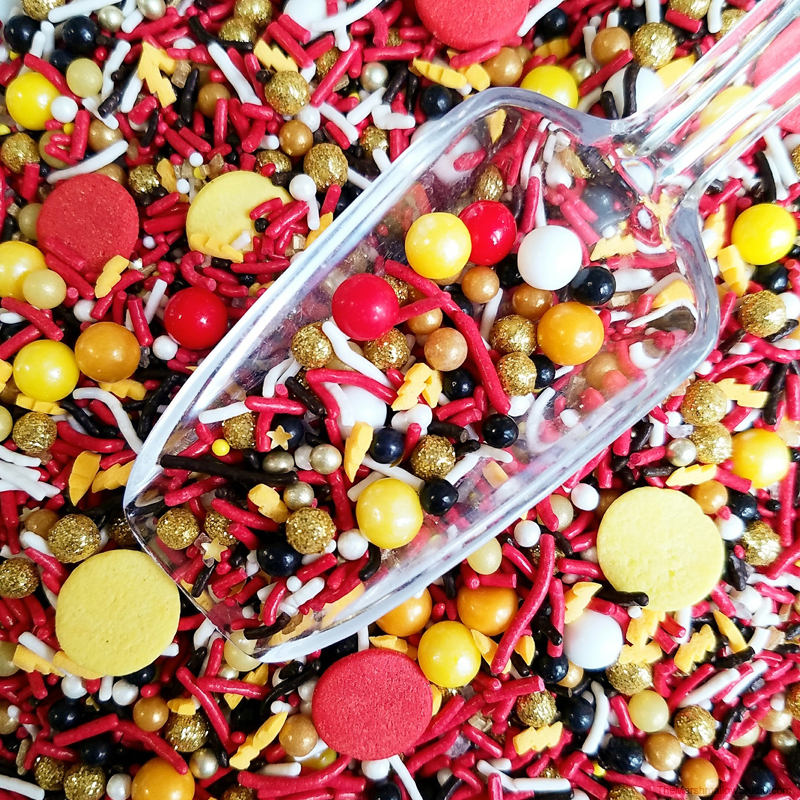 Here, I put together a special sprinkles mix just for this fab FLASH party. I didn’t count them but I think I used over 15 different kinds of sprinkles, sugars, dragees, nonpareils, sugar pearls and candies to make this mix. A little bit of white, a little bit of red, a touch of black and a dazzle of gold and yellow! 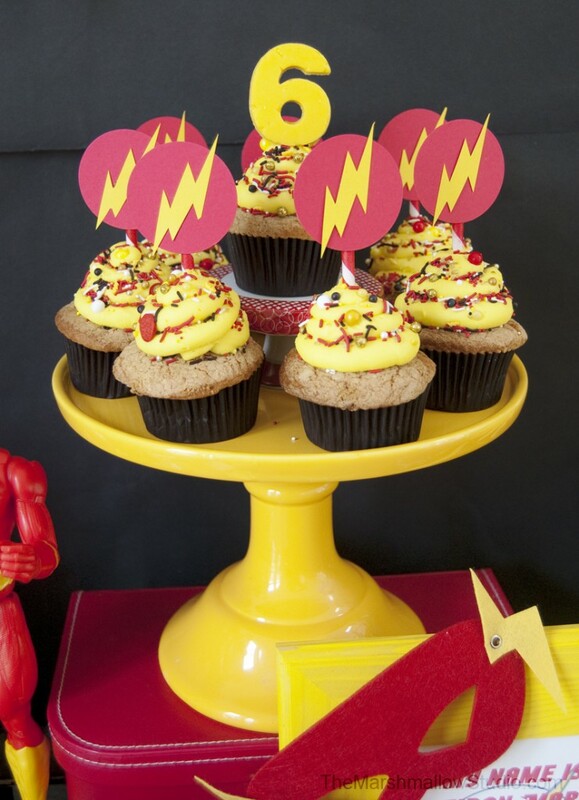 I made a number “6” cupcake topper on a silicone mold and melted Wilton Yellow Candy Melts . 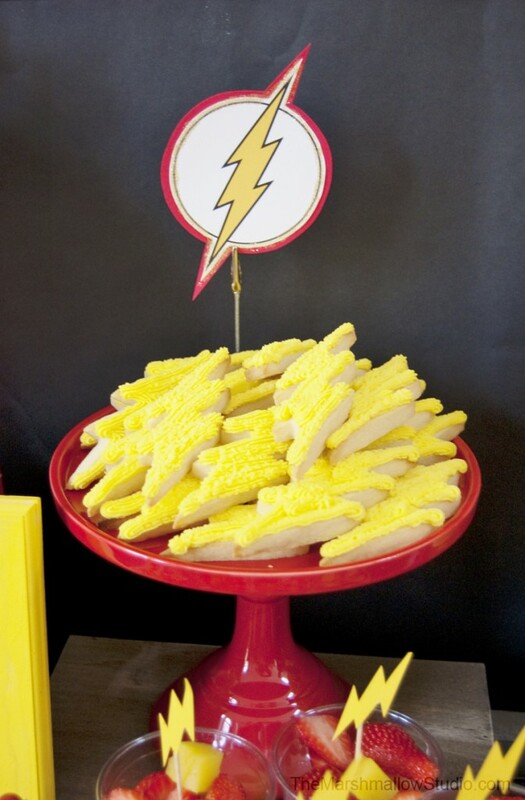 For the cookies, I know I could have cut the dough by hand into a bolt shape but WHY? Forget the flood royal icing cookie decorating method – I went for easy and delicious with yellow-colored crusting buttercream frosting on top. For the cookie themselves, I used Jenny Cookies’ recipe. It’s pretty good and fool-proof. 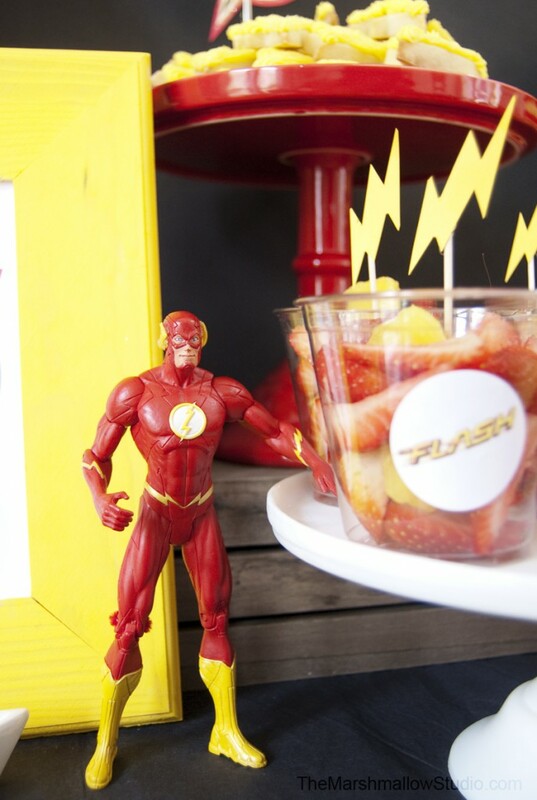 The fruit cups HAD to have lightning bolt toothpicks, of course! Having small grab-and-go food cups when feeding a group is awesome because it keeps guests moving and you won’t have large open food trays laying around for hours. I used Mini Black Popcorn Boxes to hold little goodies the kids could take home as party favors. (Okay, you found him!) 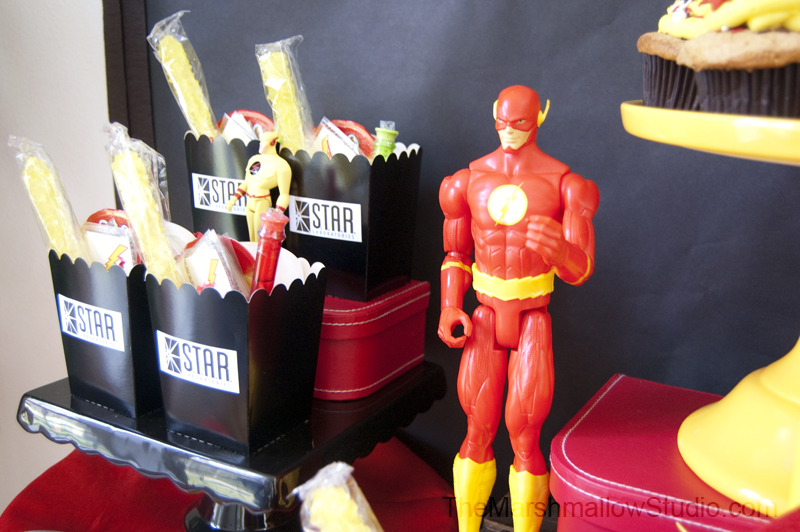 Here’s the other Flash action figure…. 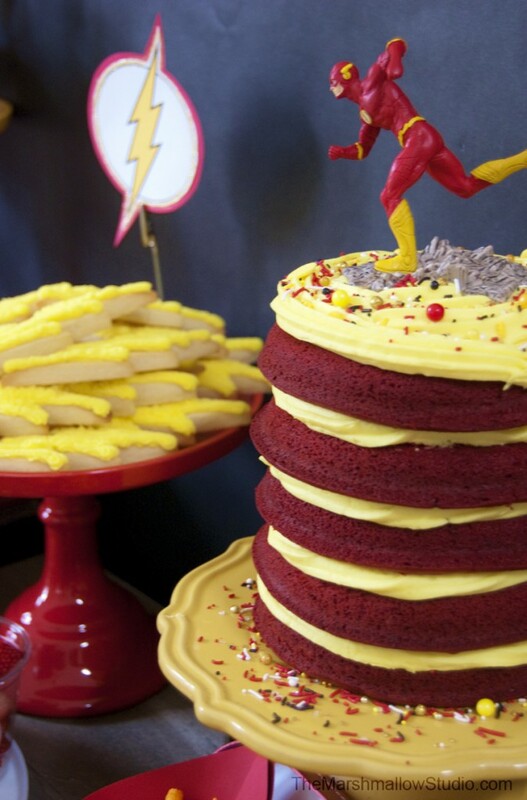 but this one is Reverse Flash, the villain. I printed S.T.A.R. Laboratories labels and attached them to the party favor boxes. 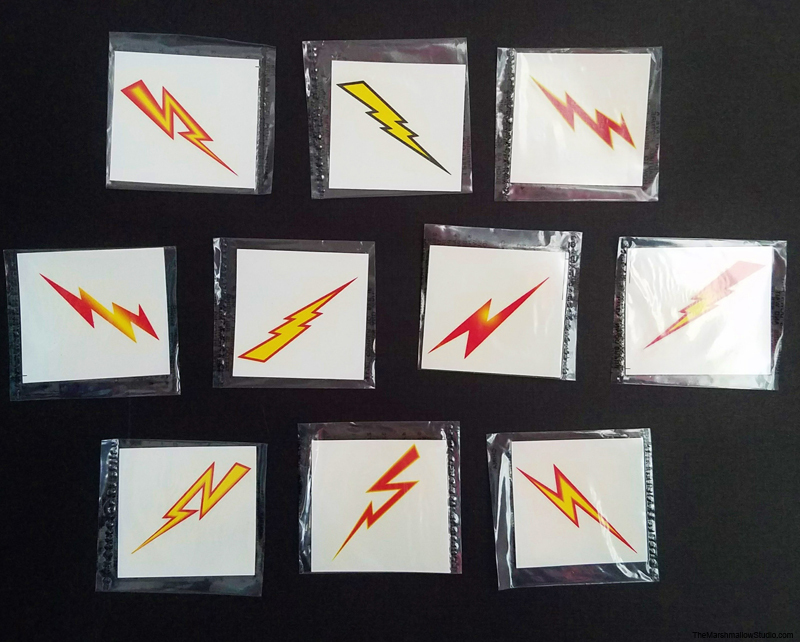 In each box, I placed a little bit of red paper shred on the bottom, a Pringles Mini Cup , a Science Beaker Bubbles Tube, a few Lightning Bolt Temporary Tattoos and a Yellow Rock Candy Pop. Keiran thought these tattoos were the coolest! Keiran absolutely LOVED his party!! My heart melted when we were singing Happy Birthday to him. I could just see in his eyes how special he was feeling and how much this moment meant to him. It’s safe to say that WE ALL had a SUPER time! Thanks for stopping by! I’d love to know what was your favorite part of this party? 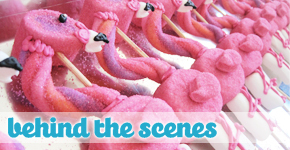 SPECIAL THANKS to Oriental Trading for partnering up with me to make this party extra SUPER!